If it's just anyone, any place will do. If it's someone important, say, "Meet me at the Derby." The Brown Derby was destined to be iconic from the start, in the way only a restaurant in the shape of a hat could be. From its inception in 1926, the oft uttered “meet me at the Derby” echoed throughout the cacophonic city of Los Angeles. The flagship Wilshire Boulevard Derby was the first of eventually four locations in the city. Collectively, the restaurants became a playground for Hollywood royalty, wannabes, yesterday’s news, hotshot agents, lovers, pugilists, gossip rag columnists, and ordinary folks looking to shine for a moment among the stars. While the Brown Derby restaurants took on a life of their own, they were founded first and foremost on the principal of good, authentic food made from the finest ingredients by skilled chefs—of course, accompanied by fair prices and expert service. The Derby’s creator, Herbert Somborn, had imagined the recipe for success in the mid-1920s when LA was then a culinary wasteland offering little more than quick service cafes and serve-yourself cafeteria style dining. Somborn, along with general manager Robert Cobb—eventual creator of the Derby’s original Cobb Salad—dreamt up an inimitable and quintessential Hollywood culinary experience. Things here don’t look as an easterner expects them to look. Some of the architecture is ‘onomatopoeic,’ if I may borrow an expression from the philologians. A coffee pot is shaped like a coffee pot, a hot dog stand looks like a hot dog, a Dutch bakery is a windmill, a restaurant called The Chinese Dragon looks like a dragon, the Brown Derby on Wilshire Blvd. is a brown derby. …oddest of all. The Brown Derby. You would never believe it unless you saw it with your own eyes… The Brown Derby, rearing itself incredibly out of the soil as though some fabulous giant of earth, feeling the chill of eventide in his marrows, had fashioned a monstrous cocky headgear for himself. A restaurant shaped absurdly like a hat! While the idea of dining inside a chapeau was novel in and of itself, even more so, Hollywood was in the Brown Derby’s bones. Somborn was not only a restaurateur, but also a movie producer, at one point the husband of screen siren Gloria Swanson, and he counted Sid Grauman amongst his friends. The Derby soon became the ultimate hotspot to see and be seen in Hollywood, where agents’ phones rung off the hook, and romances and brawls were documented and fabricated by the journalists and photographers that became fixtures in the restaurants’ scene. The Brown Derby was a constant setting for accounts of celebrity escapades in the LA Times’ gossip columns such as “Tattletale” and “Around and About in Hollywood.” The restaurant chain thrived off of the publicity, so much so that press passes were issued to journalists like Hedda Hopper, and columnists dined for half price. Cary Grant and Phyllis Brooks. Photo via Los Angeles Public Library (1939). And there was no dearth of action to report on inside the walls of the Brown Derby restaurants. In February 1930, film star John Gilbert and “hobo author” Jim Tully got into a fist fight at the Hollywood Brown Derby, born out of a grudge stemming from an unflattering article Tully wrote about Gilbert several years prior. In 1933, Marlene Dietrich caused a scene and was refused service, despite her star power, because she showed up to the Derby wearing trousers. In 1938, a fabricated overnight romance hit the gossip columns when Glenda Farrell and her agent were seen simply speaking to actor Bruce Cabot. In 1939, Clark Gable proposed to Carole Lombard in “Booth No. 5.” Later that year, Gregory Ratoff feuded with his sworn enemy, a Hollywood reporter. And in 1957, a “voluptuous blonde” and a “slim brunette” achieved their 15 minutes of fame for getting into a fistfight over a potential suitor as restaurant patrons cheered them on. It seemed one might never know who, or what, one would find during a trip to the Derby. Carole Lombard and Clark Gable at the Derby. 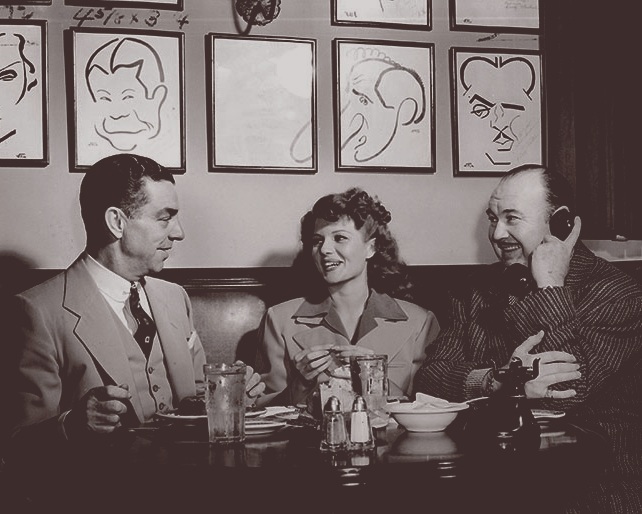 Robert Cobb, Rita Hayworth, and Paul Whitman at the Hollywood Brown Derby (1949). Photo via The Hollywood Reporter. Sometimes you see them…going into a restaurant in Hollywood one can never tell what stars one is going to see there. Some days the fans are disappointed and then again they may have a field day. The Beverly Brown Derby had a day like this last week: Charlie Chaplin, Douglas Fairbanks, and Dr. A. H. Giannini were lunching and having a conference all at once; Lyle Talbot and Lucille Lund were there; also James Stewart with Virginia Bruce, Dixie Dunbar and John Hearndon, and Cesar Romero and Betty Furness. Then there was Johnny Weaver, Allan Scott, Jimmy Cagney and his brother, Norma Talmadge with Alice Glazer and Eric Blore. The stars’ escapades and photos lived on not only in the papers, but also on the walls of the Derby restaurants themselves. Having one’s likeness drawn and hung on the wall was a veritable way to measure success—that is, attention from caricature artists Vitch and Zel in many ways meant that you had “made it.” Booths were numbered and reserved based on star power, and it would seem that the Hollywood caste systems played out no differently at the Derby restaurants than it did at the studios themselves. Careers were made, contracts were signed, and ideas were pitched all within the confines of the leather restaurant booths. Studio executives and Hollywood agents were paged constantly over the restaurant loudspeaker as calls came in—where else would they be than the Derby? Lou Pollock, actor and songwriter, ate lunch at the Hollywood Vine Street location everyday and was said to receive 25-50 calls each meal. Pollock was the undeniable winner of the “Derby Derby,” where patrons would keep track of how many times a person was paged in one sitting—his line was always ringing off the hook. Finding Lost Angeles' own Rachel and Nate as Brown Derby-style caricatures. Original artwork by Molly Kafka. 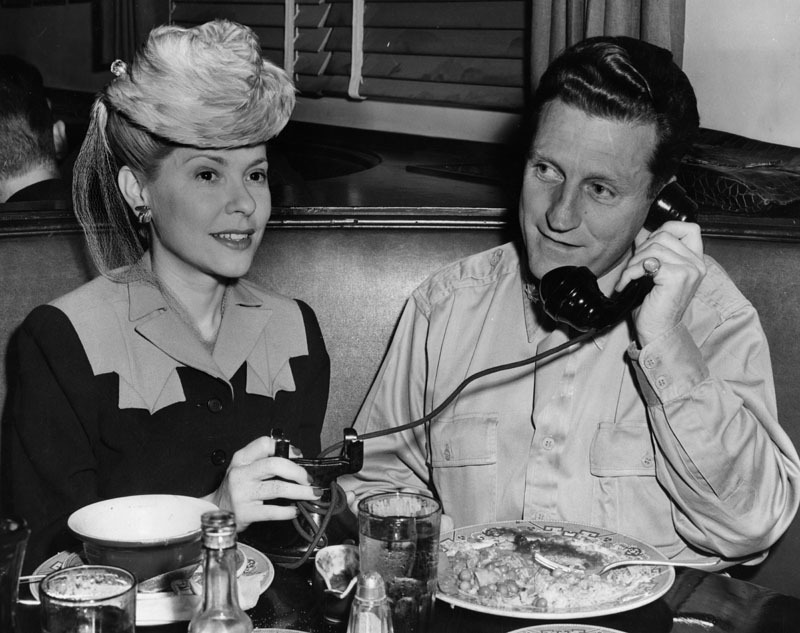 Actress June Clyde with her husband, Hollywood producer Thornton Freeland, at the Hollywood Brown Derby. Photo via Los Angeles Public Library (1943). 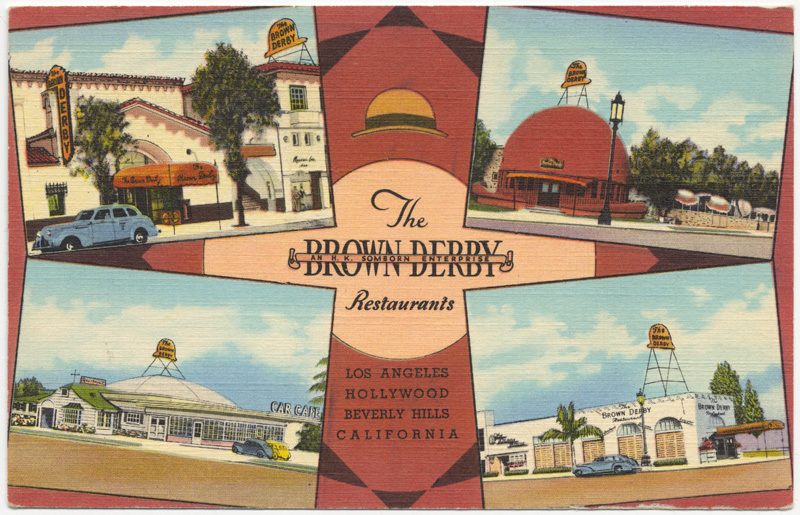 Despite preservationists’ efforts to save the restaurants in one form or another; empty promises by the final owner, Walter Scharfe, to move and reopen the Hollywood location; and an optimistic yet short-lived resuscitation of the restaurant in Pasadena in 1987, the Brown Derby Restaurants ceased to be. Over the next two decades, pieces of the Derby—fixtures, original caricatures and the like—scattered throughout the country through auctions and private acquisitions. In 2008, nearly 3000 miles away in Albany, New York, the Brown Derby briefly came alive again. The brainchild of the Mallozzi Restaurant Group, Bobby Mallozzi was inspired by his love of old Hollywood and a visit to the replica Brown Derby Restaurant that sits in Walt Disney World’s Hollywood Studios in Orlando, FL. We spoke with Mallozzi to hear more about how he sought to recreate a restaurant reminiscent of the Golden Age of Hollywood, but for a 21st Century audience. Mallozzi meticulously revived the elegance and overall experience of what it would have been like to dine at one of the original LA iterations of the restaurant. Reproduction caricatures hung next to some coveted originals (like that of Hedda Hopper), and the menu was not complete without the Cobb salad and grapefruit cake. Themed matchbooks and stirrers, and intricate brass gift cards added to the care and detail that seems missing from so many modern restaurant experiences. The restaurant shuttered in 2012, leaving the reproduction Disney version as the only remaining location tied to the original concept. The Disney recreation pays homage to the Vine Street location, where patrons can dine on the famous Cobb salad among reproduction booths and caricatures. Today, across from the shell of the once grand Ambassador Hotel, the little hat on Wilshire Boulevard now exists as an odd, non-descript dome at the center of a Koreatown strip mall. A far cry from the dapper chapeau that once offered customers a fine dining experience and a chance to be at the center of Hollywood goings-on. Despite the dome and the physical location, there is really no “finding” the lost Brown Derby at the original Wilshire location. Instead, we would recommend a trip to the Museum of Neon Art where, among other neon relics, sits the 1930s hat-shaped sign that once boldly greeted patrons at the Hollywood Vine Street location. Or, cuddle up with a Brown Derby cocktail—a Prohibition-era concoction of grapefruit, honey and whiskey—while following a Brown Derby waitress’ rise to fame in the 1932 pre-code film, What Price Hollywood? Sadly, the once larger than life restaurant chain is now left in pieces, a shadow of the success, excitement, and cultural importance the restaurants once held in the history of Los Angeles. 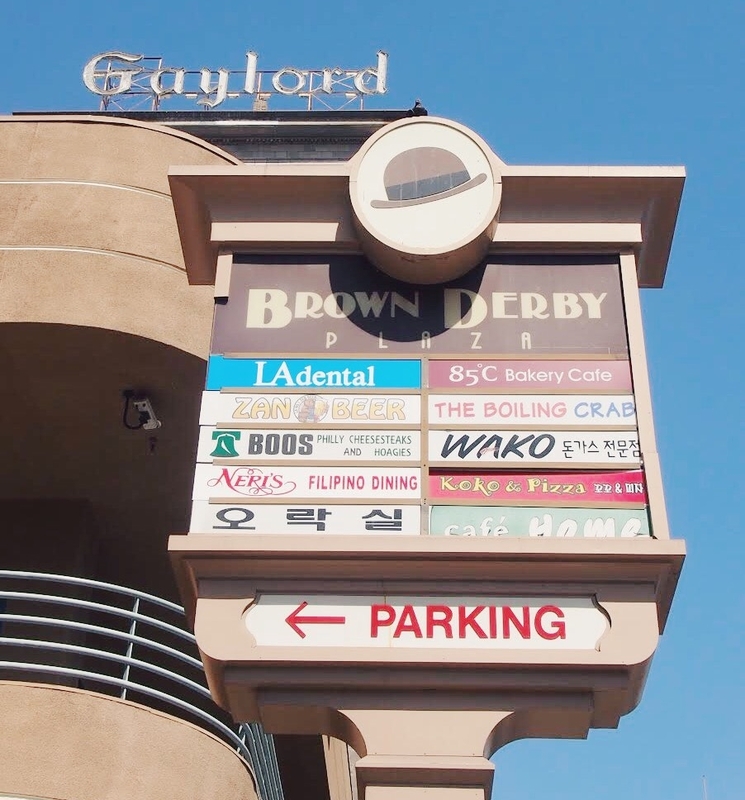 The Original Brown Derby was located at 3427 Wilshire Blvd. Babcock, Muriel. "TASHMAN TELLS WHAT TO WEAR." Los Angeles Times (1923-Current File): 2. May 08 1932. ProQuest. Web. 10 Sep. 2017. Baker, Bob. "Last of the Brown Derbys Sadly Tips a Final Farewell." Los Angeles Times (1923-Current File): 1. Apr 04 1985. ProQuest. Web. 10 Sep. 2017. CHRISTOWE, STOYAN, and Harold Petersen. "A QUICK LOOK AT LOS ANGELES." Los Angeles Times (1923-Current File): 2. Dec 18 1938. ProQuest. Web. 10 Sep. 2017. DOSTI, ROSE. "Pasadenans Warm to the Embrace of an Old Hollywood Favorite." Los Angeles Times (1923-Current File): 1. Dec 26 1986. ProQuest. Web. 10 Sep. 2017. "JIMMIE FIDLER IN HOLLYWOOD." Los Angeles Times (1923-Current File): 1. Nov 14 1939. ProQuest. Web. 10 Sep. 2017. "GILBERT PLEDGES TROUBLE IF HE MEETS TULLY AGAIN." Los Angeles Times (1923-Current File): 1. Feb 13 1930. ProQuest. Web. 10 Sep. 2017. Landon, Gabrielle. "Picture Stars Enjoy Kentucky Hospitality." Los Angeles Times (1923-Current File): 1. Sep 06 1936. ProQuest. Web. 10 Sep. 2017. Mallozzi, Robert. Personal Interview. September 12, 2017. "NEWS OF THE CAFES." Los Angeles Times (1923-Current File): 7. Jan 15 1936. ProQuest. Web. 10 Sep. 2017. Perlman, Jeffrey, and KENNETH FANNUCHI. "L.A. LANDMARK." Los Angeles Times (1923-Current File): 2. Sep 21 1980. ProQuest. Web. 10 Sep. 2017. Read, Kendall. "Around and about in Hollywood." Los Angeles Times (1923-Current File): 8. May 24 1938. ProQuest. Web. 10 Sep. 2017. Scheuer, Philip K. "MID NIGHT on the BOULEVARD." Los Angeles Times (1923-Current File): 1. Apr 20 1930. ProQuest. Web. 10 Sep. 2017. Scheuer, Philip K. "NIGHT CLUBS AND CAFES BLOSSOM IN MOVIE CAPITAL." Los Angeles Times (1923-Current File): 2. Jul 18 1937. ProQuest. Web. 10 Sep. 2017. "TATTLETALE." Los Angeles Times (1923-Current File): 1. Nov 26 1939. ProQuest. Web. 10 Sep. 2017. "Women Battle in Hollywood Street Over Man." Los Angeles Times (1923-Current File): 2. Jul 22 1957. ProQuest. Web. 10 Sep. 2017.